The below infographic – in conjunction with the detailed dissection of the topic in our Google’s URL Builder eBook, which offers all you need to know about the customisation of URLs to help increase the granular nature of the data a brand can gather regarding referral traffic. 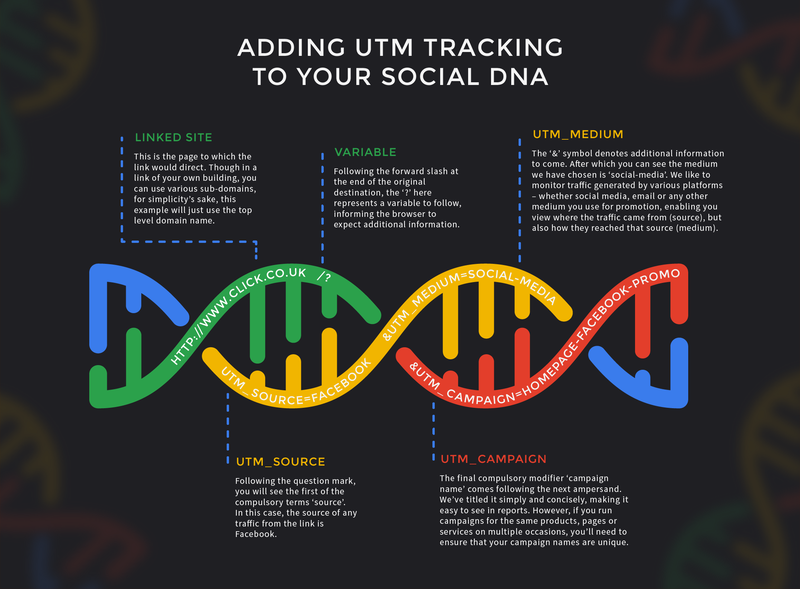 Whether your brand practices thought leadership through dissemination of content in eBooks or simply posts to multiple social media channels, the use of UTM tracking can help to monitor and review and improve the performance of your work in all channels. In addition to the URLs, of course, you’ll need to customise your Analytics reporting or download a ready made custom dashboard (which you can find in the social media toolkit), but whichever way you choose to approach it, the increased level of information you can gather allows you to learn which variety of asset works best on which channel, which tone of voice best suits your audience, or with A/B testing of links even the wording of posts which earned the most traffic. At Click Consult, we believe that even the most creative areas of search marketing work best when underpinned by a sound, scientific, data-driven strategy and are happy to help with blogs on any area of our vast experience in the industry. Need something explaining, or your mind refreshed? Why not let us know in the comments section. Find out what else is on offer in our comprehensive resource section, or if you’d like to find out more about what our vast search marketing experience can do to help your brand reach its full potential, contact us today.